On Tuesday night for Young Women we went down to St. George to take pictures of the girls at the temple. Then we went through the visitor's center and out for ice cream. This is my favorite picture of the week. I took it after we were done in the Visitor's Center and it was dark outside. One of the most lovely sights in the world...the temple brightly lit against the night sky. Like I've said before, we just moved here and we haven't had the chance to go see the St. George temple yet. I've never even been to it! (I'm from Logan originally). I didn't know there was a visitor's center either...thank you for the beautiful picture! We will be taking our children soon! The saint george temple is freakishly bright -- esp when one of your friends gets married in Augutst -- you think you might go blind. 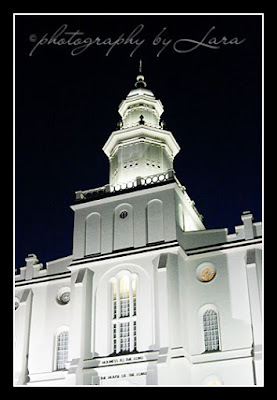 I love the Saint George temple. Great picture. That is such a fun mutual. I'm kind of jealous. Love all the pictures. Did you know I lLove to See the Temple is in the Primary Program this year? Such a beautiful photo! My favorite sight coming into Cache Valley out of Sardine Canyon is the temple on the hill. Beautiful pictures!!!! I love the picture of the temple. I would love a copy of that one. It is great. That is a very beautiful photo of that temple! Well done!